There are many years where there is a doubt about who the top overall pick will be. This year is not one of those years. The Phoenix Mercury are first on the clock on the basis of winning the draft lottery this past September and have the ability to draft Brittney Griner, a potential transcendent WNBA player. Brittney Griner (Baylor): What else can you say about Brittney Griner? In four years at Baylor Griner has revolutionized post play in the women’s game dominating the interior with her 86” wingspan. The Baylor senior is the first college player to amass over 2000 points and 500 rebounds in a season. Her interior dominance has led the Baylor Bears to a remarkable 106-4 record over the past three seasons. Griner excels at all facts of the game, combining a deft shooting touch with tremendous athleticism in a 6’ 8” frame. She’s a lock to be taken first overall and is arguably the best player in the world today, college or professional. Elena Delle Donne (Delaware): Delle Donne is a supremely talented guard/forward with outstanding size and leaping ability. In any other year she may be a lock for the number one overall pick. A versatile inside/outside scorer, Delle Donne will provide immediate help to the team that drafts her (Chicago if she goes number two). Delle Donne combines the skills of a perimeter player with the size of an interior player. She’s most comfortable on the perimeter, but can also thrive in the post if needed. 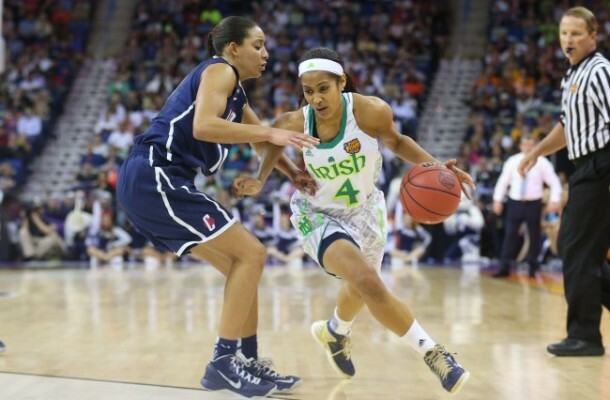 Skyler Diggins (Notre Dame): Diggins is neck and neck with Delle Donne as the second best prospect. The three-time All-American point guard is extremely versatile with the ability to play both guard positions. She can lead the team from the point guard spot but also provide reliable scoring. A consummate leader, Diggins has a high basketball IQ and is extremely tenacious on the defensive end. Markel Walker (UCLA): Walker is a stat-sheet-stuffer, third on the team in scoring, and second in rebounding while leading the team in assists and steals. The versatile UCLA senior can play both shooting guard and small forward and has the ability to be a difference maker at the next level on the defensive end. T’Shauna Rodgers (Georgetown): “Sugar” Rodgers the epitome of a “pure scorer”. She excels both as a creator of her own shot and has a spot-up shooter. Her ranch extends to the three point arc. Rodgers will be an excellent pickup for a club looking for a go-to scorer. Rodgers can clearly impact a team offensively when she gets hot, but on the negative side she is very much a player who often requires a high volume of shots to get her points. Tayler Hill (Ohio State): Tayler Hill is an intriguing prospect due. The all-time leading scorer in the State of Minnesota for prep basketball, Hill came to Ohio State with a reputation as a pure scorer. Her initial success at Ohio State was on the defensive end where she’s made the All Big Ten defensive team each year as a Buckeye. Over the past two seasons Hill has re-captured her scoring touch, average 20 points per game, although her field goal percentage has suffered this season. Hill has the ability to be an immediate contributor as a starter or off the bench, mainly at shooting guard but also with the ability to play the point guard position. Angel Goodrich (Kansas:) The 5’4” Goodrich true point guard known for her tenacity and toughness on the defensive end. Goodrich is adept at pressuring the basketball defensively while thriving in an up-tempo style on offense. Although she’s a bit undersized she makes up for the lack of size with great strength and athleticism. She’s an ideal pure point guard with skills that should smoothly translate to the WNBA. Kayla Alexander (Syracuse): The Canadian has tremendous size and shooting touch both from the field and from the charity stripe, regularly leading her team in points, blocks, rebounds and shooting percentage. She doesn’t quite have the size or strength of a player like Griner, but makes up for it with a tremendously balanced all-around game. Alexander is not the type of player who could dominate in the WNBA like Griner, but will be a dependable post player with the ability to be a go-to scorer. Tianna Hawkins (Maryland): Through hard work Hawkins has risen from a marginal top 100 high school player to one of the best players in the ACC. She is extremely aggressive and hard working and tenacious on the offensive and defensive glass. She has ideal size for a power forward and should be an immediate contributor to the team that drafts her. Lindsey Moore (Nebraska): Moore is an interesting player. She’s a great college player, extremely efficient with solid range. She protects the ball well and is a great leader on the court, getting everyone involved. The biggest knock on Moore is she lacks high level quickness that could be exposed at the professional level. Moore should be a solid contributor in the WNBA but may lack the athletic ability to be an elite player.